Lexington (KY) Catholic quarterback Beau Allen was offered by Michigan. He’s 6’2″, 200 lbs. with offers from Bowling Green and Kentucky. He’s a 247 Sports 3-star, the #14 pro-style quarterback, and #360 overall. Right now both of his Crystal Ball picks are for Kentucky. 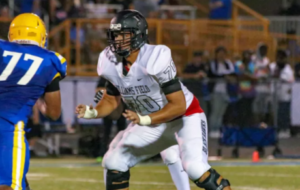 Centennial (CO) Eaglecrest offensive tackle Reece Atteberry was offered by Michigan. He’s a 6’5″, 260-pounder with offers from Colorado, Colorado State, Nebraska, and Oregon, among others. He’s a 247 Sports 4-star, the #26 offensive tackle, and #206 overall. Folsom (CA) Folsom wide receiver Elijhah Badger was offered by Michigan. He’s a 6’1″, 185 lb. prospect with offers from Florida, Oregon, and USC. He’s a 247 Sports 3-star, the #58 wide receiver, and #291 overall. 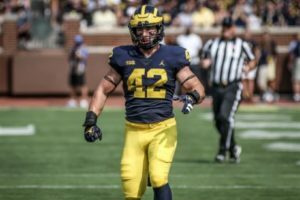 He’s a teammate of 2020 running back Daniyel Ngata, who also picked up a Michigan offer recently (see below). Hit the jump for lots and lots more offers. Ashburn (VA) Broad Run running back Tim Baldwin was offered by Michigan. He’s 5’11”, 187 lbs. with offers from Maryland, Virginia, and West Virginia, among others. He’s a 247 Sports 3-star, the #18 running back, and #181 overall. Baldwin took a visit to Michigan this past weekend. Brentwood (CA) Liberty quarterback Jay Butterfield was offered by Michigan. He’s a 6’6″, 180-pounder with offers from Arizona State, Cal, and Tennessee, among others. As a sophomore in 2017, he was 82/146 (56.2%) for 1,394 yards, 15 touchdowns, and 4 interceptions. Austin (TX) Lake Travis quarterback Hudson Card was offered by Michigan. He’s a 6’2″, 175 lb. prospect with offers from Alabama, Auburn, Ohio State, Oregon, and Texas. He’s a 247 Sports 4-star, the #2 dual-threat quarterback, and the #170 prospect in the 2020 class. Card played some receiver as a sophomore due to having another elite quarterback on the Lake Travis roster (must be nice to have that kind of talent on a high school team), so kind of like Dorian Thompson-Robinson, this will be his first season under center. Memphis (TN) White Station offensive tackle Ray Curry, Jr. was offered by Michigan. He’s a 6’5″, 300 lb. 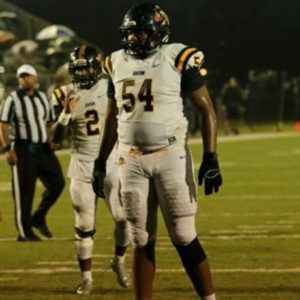 prospect with offers from Alabama, Auburn, Georgia, LSU, and Tennessee, among others. He’s a 247 Sports 3-star, the #31 offensive tackle, and #256 overall. Suwanee (GA) North Gwinnett wide receiver Josh Downs was offered by Michigan. 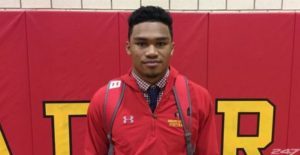 He’s a 5’10”, 165-pounder with offers from Boston College, Kentucky, Louisville, North Carolina, and West Virginia, among others. Westlake Village (CA) wide receiver Bryce Farrell was offered by Michigan. He’s a 5’11”, 170 lb. prospect with offers from Arizona State, Florida, Nebraska, and TCU, among others. He’s a 247 Sports 4-star, the #32 wide receiver, and #149 overall. 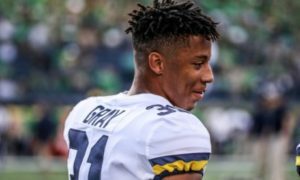 As a sophomore in 2017, he caught 63 passes for 1,168 yards (18.5 yards/catch) and 9 touchdowns. Littleton (CO) Columbine offensive tackle Andrew Gentry was offered by Michigan. He’s a 6’8″, 290-pounder with offers for Arkansas, Colorado, Colorado State, Nebraska, Oklahoma, USC, and others. He’s a 247 Sports 4-star, the #28 offensive tackle, and #217 overall. Memphis (TN) University School offensive guard Marcus Henderson III was offered by Michigan. He’s a 6’4″, 315 lb. prospect with offers from Alabama, Auburn, Florida, LSU, and Tennessee, among others. He’s a 247 Sports 4-star, the #13 offensive tackle, and #80 overall. 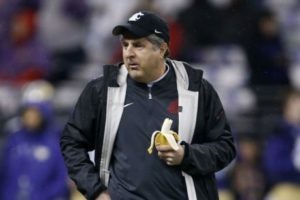 He has one prediction for Ole Miss, because why would anyone not go to Ole Miss when they have proven themselves so trustworthy over the years? 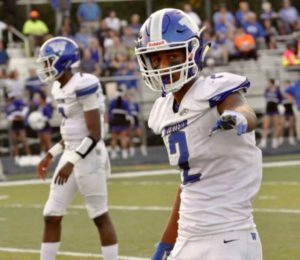 Tulsa (OK) Booker T. Washington wide receiver Javian Hester was offered by Michigan. He’s a 6’4″, 174 lb. prospect with offers from Arkansas, Ohio State, and Oklahoma. He’s a 247 Sports 4-star, the #19 wide receiver, and #99 overall. As a sophomore in 2017, he caught 37 passes for 697 yards and 6 touchdowns. Norfolk (VA) Christian running back LaMareon James was offered by Michigan. He’s a 5’11”, 165 lb. prospect who also holds an offer from Maryland. As a sophomore in 2017, he had 992 rushing yards, 568 receiving yards, and 23 total touchdowns. Depending on how his body develops, he could play running back, receiver, or cornerback at the next level. 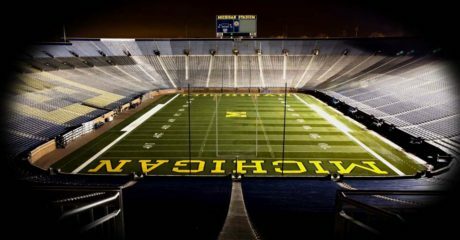 Henrico (VA) Henrico running back Eric McDaniels was offered by Michigan. He’s a 6’0″, 210-pounder with offers from Florida and South Carolina, among others. McDaniels doesn’t have great speed, but he’s big and thick and runs hard. Buford (GA) Buford center Seth McLaughlin was offered by Michigan. He’s a 6’4″, 260 lb. prospect with offers from Alabama, Auburn, Florida State, Georgia, LSU, and Miami, among others. 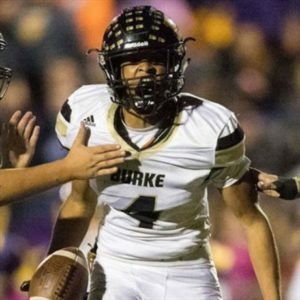 He attends the same school as incoming freshman running back Christian Turner. Weare (NH) Stark quarterback Parker McQuarrie was offered by Michigan. He’s a 6’7″, 208 lb. kid whose first offer was from Michigan. He claims a 5.09 forty. The competition in New Hampshire is . . . not great. 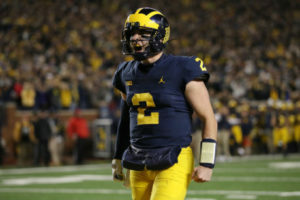 Scottsdale (AZ) Chaparral quarterback Jack Miller was offered by Michigan. He’s a 6’4″, 210 lb. prospect with offers from Alabama, Arizona, Arizona State, Auburn, Florida State, LSU, and Oklahoma State, among others. He’s a 247 Sports 4-star, the #5 pro-style quarterback, and #79 overall. 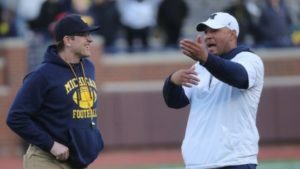 He attends the alma mater of former Michigan offensive tackle Taylor Lewan and defensive end Craig Roh. 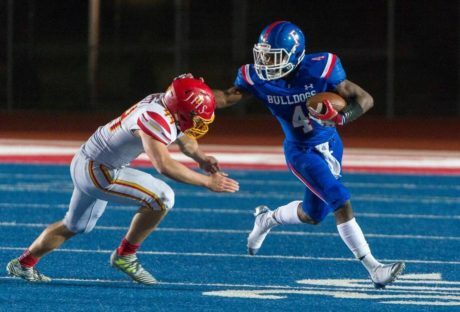 Folsom (CA) Folsom running back Daniyel Ngata was offered by Michigan. He’s a 5’9″, 185 lb. prospect with offers from Alabama, Nebraska, Notre Dame, and Oregon, among others. As a sophomore in 2017, he ran the ball 95 times for 863 yards (9.1 yards/carry) and 11 touchdowns. 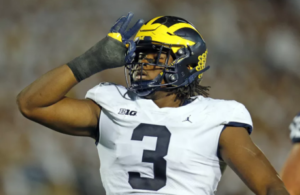 He’s a teammate of Elijhah Badger (see above), and Michigan is also recruiting his older brother Joe in the 2019 class. Fort Lauderdale (FL) St. Thomas Aquinas wide receiver Xavier Restrepo was offered by Michigan. He’s a 5’10”, 178 lb. prospect with offers from Miami, Oregon, and Texas, among others. 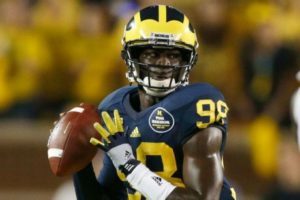 As a sophomore in 2017, he scored 11 touchdowns, made 4 interceptions, and blocked 5 field goal attempts. He’s a jack-of-all-trades in high school who plays quarterback, running back, wide receiver, safety, and kick returner. At the very least, you can cross off quarterback as an option in college, but he could play any of those other spots. Tucson (AZ) Salpointe running back Bijan Robinson was offered by Michigan. He’s a 5’11”, 187 lb. prospect with offers from Alabama, Arizona, Arizona State, LSU, and USC, among others. 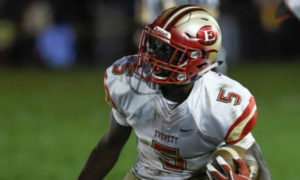 He’s a 247 Sports 4-star, the #4 running back, and #30 overall. 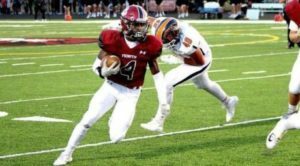 As a sophomore in 2017, he carried the ball 189 times for 2,023 yards (10.7 yards/carry) and 26 touchdowns; he added 3 receiving touchdowns and 1 punt return score. Camilla (GA) Mitchell quarterback James Thomas was offered by Michigan. He’s a 6’2″, 190 lb. 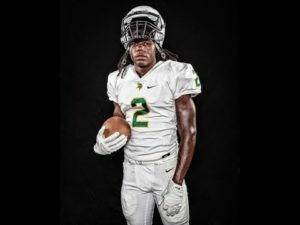 prospect with another offer from Georgia. He’s a 247 Sports 3-star, the #30 athlete, and #365 overall. 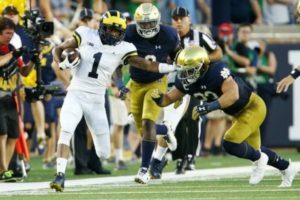 Thomas played receiver as a freshman and has transitioned to the quarterback spot. He could potentially play either spot in college; he’s very unpolished at quarterback, but he has some pretty good raw skills. Chicago (IL) Marist wide receiver Jadon Thompson was offered by Michigan. He’s a 6’2″, 160 lb-pounder with offers from Illinois, Indiana, and Iowa, among others. He’s a 247 Sports 3-star, the #71 wide receiver, and #351 overall. As a sophomore in 2017, he caught 49 passes for 854 yards and 9 touchdowns. Thompson is a lanky, natural receiver with good speed. Midlothian (VA) Cosby tight end Ethan West was offered by Michigan. He’s a 6’4″, 220 lb. prospect with offers from Florida, LSU, Maryland, and Virginia Tech, among others. He’s a 247 Sports 3-star, the #9 inside linebacker, and #306 overall. He claims a 4.62 forty, a 255 lb. bench, and a 405 lb. squat. 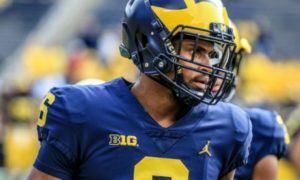 West could play linebacker or tight end in college. I’ll take both Atteberry and Curry. Atteberry looks like he could make 6’7 285 coming out. Curry is going to be an enormous human being, I’m not sure where you find 30 better 16 year old tackles prospects, but maybe Thunder can find something wrong with him.